Stop Coal. Protect the Climate! 17 Uhr Auftakt am Markt in Aachen, über Elisenbrunnen und Theaterstrasse zum Suermondtplatz. Ende 19 Uhr. Warum wir am 7. Februar in Aachen gegen die #Kohlekommission protestieren? Weil deren Ergebnis ein Abschaltplan für den Planeten ist. 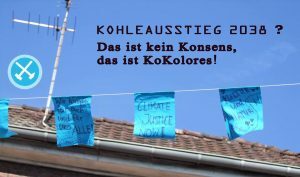 Wir brauchen einen #Kohleausstieg zur Verhinderung einer #Klimakrise.2038 ist zu spät, weil die Welt dann untergeht. 2038 - Das ist kein Konsens, das ist Kokolores! System change not climate change. Respect existence or expect resistance. "Lasst uns heute beginnen, eine Welt zu erschaffen, in der wir nicht auf Kosten anderer leben!" 28. 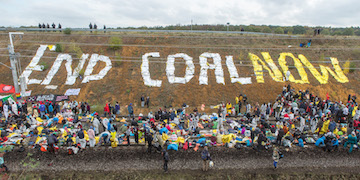 October 2018 Largest action of civil disobedience against coal +++ "Coal mines of the Rhineland mining area have become symbols of the climate movement"
The Legal Team for all is the anti-repression-crew for the actiondays 2017 + 2018. If you have any questionns, contact them: legal_team_fuer_alle@posteo.de (pgp-Key). Please also write to them if you recieve any letters or similar things from the police, court or prosecution after the actions. Our solidarity against their repression! There is plenty of justified criticism of facebook. As many people - even within Ende Gelaende - use facebook, we also do. But on the upside: as long as you don't use this link, facebook will not notice your visit at our page! Keep up to date and subscribe to the newsletter! Thank you! We subscribed your email address to the list.